Discover the royal heritage of the Karangasem kingdom on a full-day tour! Visit several fascinating sites in East Bali, starting with the regal Karangasem Palace. Explore Taman Sukasada (Sukasada Park), Sebetan Village and the Tirta Gangga water palace with an expert local guide. You’ll learn about historical influences on the region’s architectural design and take in many scenic landscapes along the way. Round-trip hotel transport by comfortable coach is included. After hotel pickup in the morning, drive eastward by comfortable coach toward the Karangasem region of Bali to visit Karangasem Palace (Puri Agung Karangasem). Built in the 19th century by Anak Agung Gede Ketlantik—the area's first king—the palace is a showcase for unique architecture, which combines Balinese, Chinese and European designs. Your guide will enlighten you about the kingdom and Bali’s historical relations with the Dutch before leaving the royal palace. Head east to visit the beautiful gardens of Sukasada Park. Your guide will point out the old Karangasem Empire heritage building, set in the middle of a large fishpond. Designed in a European style that reflects various cultural designs, the building was used by the Karangasem king for relaxation and to host important guests. Inside, you’ll find a collection of Karangasem artifacts including photos of family kings, royal furniture and other objects. Admire panoramic views of the lovely pond and Mt Agung on the north side before your guide transports you to the Sebetan village, well known for growing salak—commonly called snake fruit for its reddish-brown scaly skin. A stroll along the town road offers breathtaking vistas of mountains, palm trees and villages and in the distance, against a scenic backdrop of the blue ocean. Before your last destination at Tirta Gangga, make a lunch stop at a nearby restaurant that serves Indonesian fare (own expense). 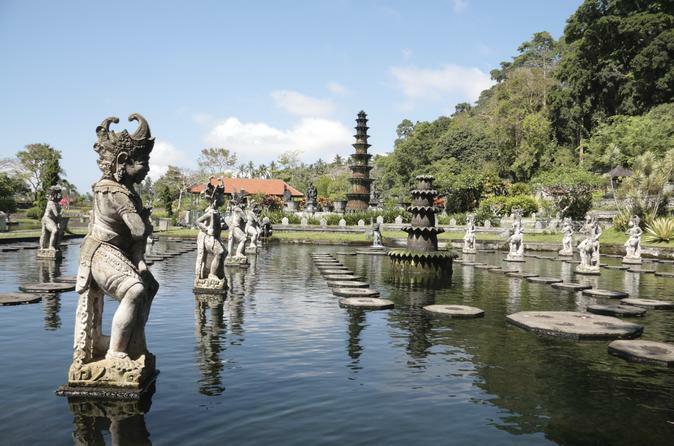 Then explore the water palace of Tirta Gangga, built in 1948 by the Karangasem King of Anak. Here, tiered water fountains with stone sculptures of mythical creatures spout water into bathing pools of the former royal palace. Spend some time enjoying great photo ops amid the park’s tranquil gardens before your guide transports you back to your hotel.